The daughter of Asia Bibi, a Christian woman being held on death row in Pakistan, has spoken out about the alleged torture her mother experienced at the hands of alleged Islamic zealots. 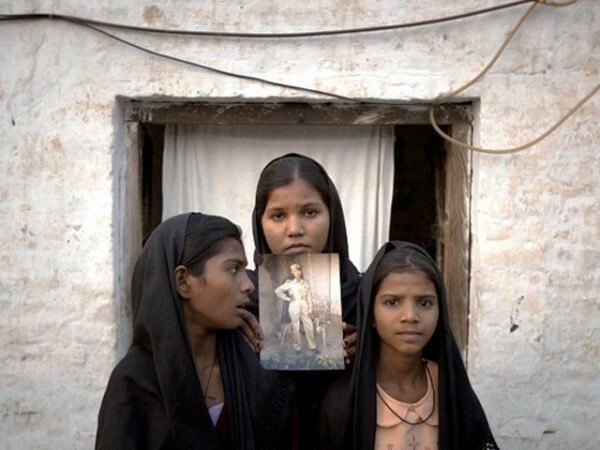 The daughters of Asia Bibi with an image of their mother, standing outside their residence in Sheikhupura on November 13, 2010. The beating allegedly began after Bibi encountered some Muslim workers in the field where they all worked. The women accused her of being unclean because of her Christian faith and later said that she made disparaging remarks against the prophet Mohammed. After the beating, Bibi was taken into custody and sentenced to be hanged. Her case has drawn international attention from Christian and women’s rights organizations. Not only was Masih and her mother abused, but her 15-year-old daughter Esha was, too. Mr. Masih has appealed to the Pope and President Obama to try and secure his wife’s release.